Ballerina is using Smore newsletters to spread the word online. Picture this… The biggest creature on Earth cutting through the ocean at 30 miles per hour during short bursts. Flapping its “V” shaped fluke up and down.The Balsenoptera musculus has no trouble swimming underwater with its long, slim, and narrow body. You may be wondering what the Balsenoptera musculus is. Does the name Blue Whale sound familiar? This aquatic animal has a fascinating diet, wide ranging habitat, and attractive appearance. The Blue Whale’s diet is bewildering and odd considering its size. You’ll be shocked to learn that only miniature krill and other small ocean residents can fit inside of this massive monsters mouth. Even we can eat larger things than that! In addition, this colossal has a very petite esophagus. Due to this fact, the Blue Whale eats with a process called filter feeding. To go along with that, filter feeding allows this huge varmint to filter krill, and super puny amounts of water and sand. Again, since these unique animals can’t handle large foods, some of the sand and water gets filtered out back into the ocean. 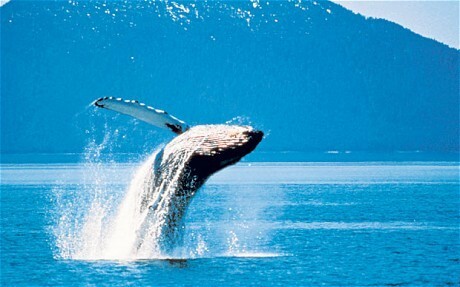 Although the Blue Whale can’t enjoy some bigger seafoods, it still has a terrific way of getting its daily nutrients. Northern, and Southern, and Pygmy, oh my! The Blue Whale’s habitat is extraordinarily exceptional. Why is that? This fact comes into place because you can find one of the three species anywhere in the world. Amazingly, this fact is a 100% true statement. Can’t you almost see Blue Whales swimming everywhere around the world with their babies and family?. The most common location in which to find one of these underwater citizens are waters with colder temperatures. What this means is that the Arctic and Antarctic oceans are where to find Blue Whales. Tropical waters are where they live during feeding/migrating seasons. Northern and Southern Blue Whale’s never meet. Along with the Southern species, the Pygmy species also enjoy the South Pacific, but they also enjoy the Indian Ocean. Furthermore, the most enormous animal on Earth does have a wide ranging habitat. The Blue Whale has an attractive appearance like no other. Close your eyes and imagine a grayish blue animal that resembles a submarine. A 70-100 and possibly longer foot creature with a special triangular dorsal fin. As big as a 10 story building or three school buses. It is remarkable to learn that this incredible critter can get to over 150 tons! Instead of teeth, the Blue Whale has a grand amount of 395 bristles in its mouth. In sum, this magnificent mammal has a fantastic presence. 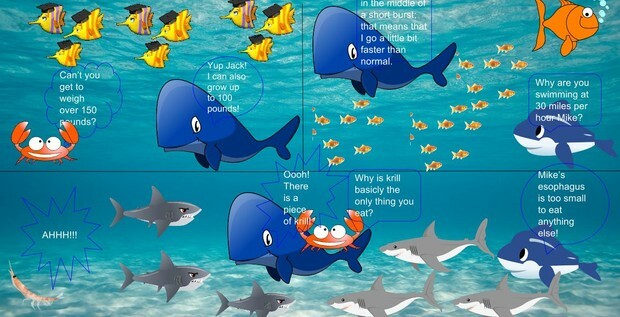 In conclusion, the diet, habitat, and appearance are super important to the Blue Whale. A steady diet helps this colossal critter stay healthy. A nice habitat helps this aquatic animal survive. Appearance helps this marvelous mammal get through the water, eat, and be able to live in the ocean. In my opinion, I think that the Blue Whale is an exceptionally excellent part of the seaworld. 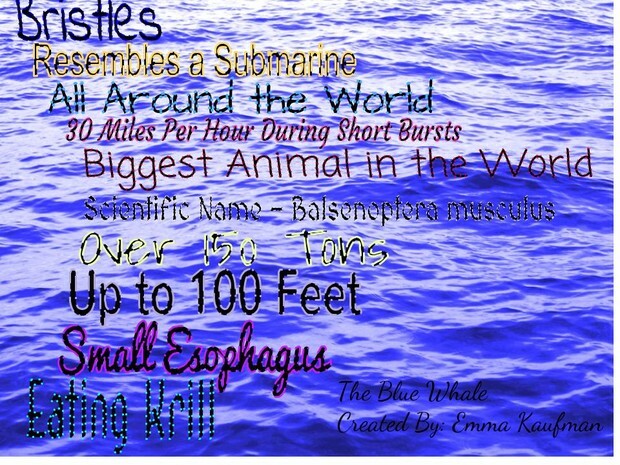 This is a Word Wall of key words an phrases that are important to the Blue Whale. Below is a three panel comic strip with information about the Balsenoptera musculus. 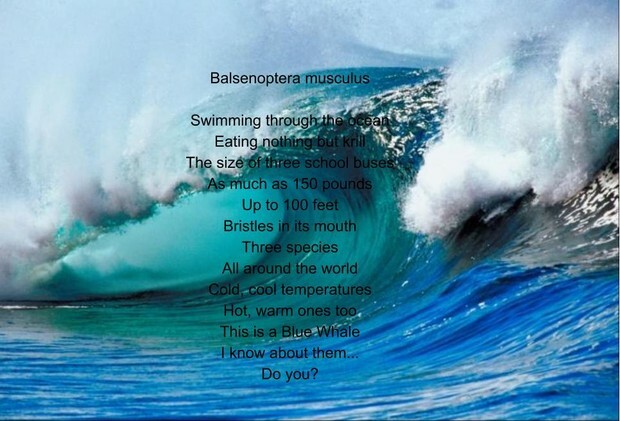 Below is a free verse poem about the Blue Whale. 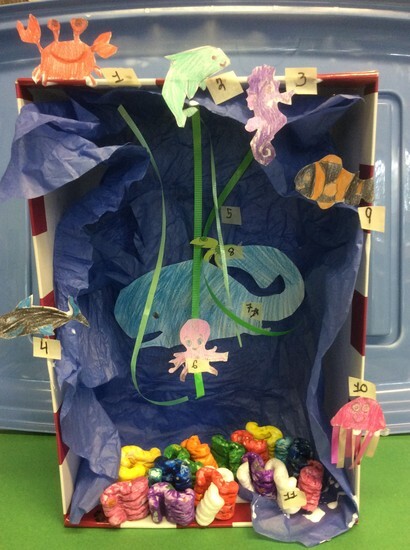 In my diorama I have a Blue Whale, Coral Reef, Seaweed, an Octopus, a Seahorse, a Clown fish, a Shark, a Dolphin, a Crab, a Sea Turtle, and a Jellyfish. I really enjoyed the workshop "Go Fish!" 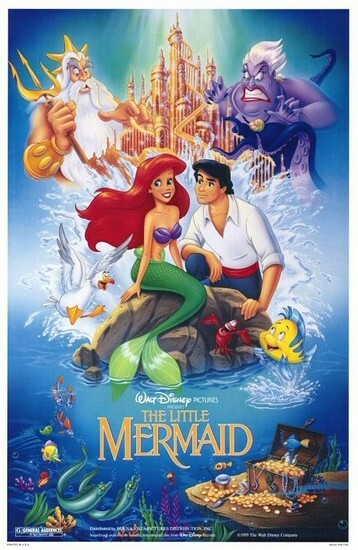 The theme of my fish tank is the Little Mermaid. 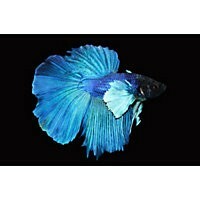 I have two Elephant Ear Halfmoon Betta fish which are two inches each. I also have two Elephant Ear Delta Tail Betta fish which are two inches each as well. I will need eight gallons out of twenty gallons of water to support my fish. I had $250 to spend and I spent $204.99. I spent $124.97 on decorations and necessities for my fish tank and $79.96 on fish. I have $45.01 left. I'm really happy that I stayed within budget and I'm even more happy with my decisions and choices. 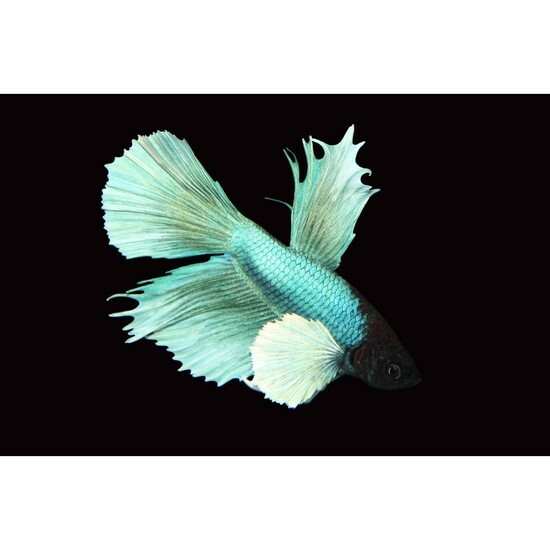 These are images of the Little Mermaid, the Elephant Ear Halfmoon Betta, and the Elephant Ear Delta Tail Betta. These following videos are extras about the Blue Whale. Amazing Blue Whale - the Biggest Whale in the World!